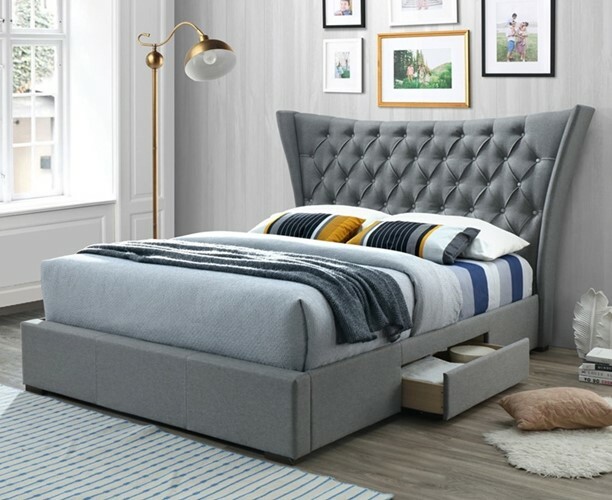 The Middleton Grey Velvet Fabric Platform Bed features an over sized Winged Hand Tufted Headboard, which is sure to create a bold statement in any bedroom. The soft tufted headboard provides a comfortable spot to relax your back while you read or watch TV in bed. The bed features two storage drawers on either side of the bed frame, perfect for stowing bed sheets,other linens or out-of-season clothing. Combining fashion and function, the bed provides you with storage space and a modern neutral design to match your existing color scheme and decor. The Middleton is fitted with traditional wooden slats for stability and beautiful dark wood cubed feet. Please refer to pictures for full dimensions.